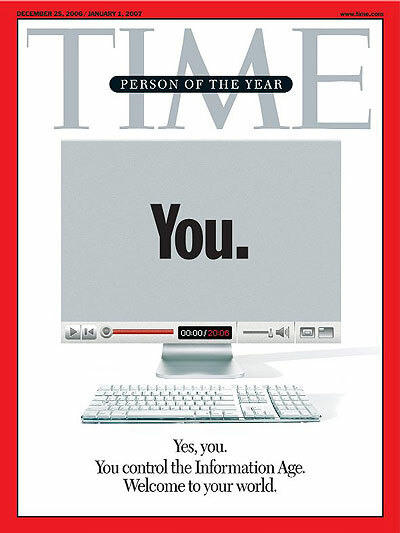 Already in 2006 Time Magazine voted the most important person on the planet to be YOU. They were dead wrong of course. In that year it wasn’t YOU that was important, it was THEM. Them meaning all of your friends you brought along to the different social networks that rose like volcano’s in a flat landscape. 2006 might have been the break through of many social networks and their FREE business models. These business models didn’t make YOU important, it made the network important (or social graph, only they didn’t use that terminology then). Advertising networks gained momentum too. Everyone trying to get a piece of the Social Networking Walhalla harassing the user (that’s you) with advertisement. $ BLN dollar valuations of companies who’s main objective is to get those advertisement dollars rolling. The user gets his service for free, but as a result he has to put up with advertisement. That has got to be by far the worst nightmare of any Marketeer right? You have a potential customer, according to all of the semantic and contextual data the Social Networking site has collected for you. You show this potential customer an advertisement, making sure it fits the profile. Only to discover that this potential customer does the same thing he did in more traditional media, he ignores it. It is the catch 22 of web 2.0. Everyone trapped in the FREE business model where advertisement money is pumped around but the only one paying the bill is the advertiser who doesn’t get much value for his dear advertisement budgets. The social networking site is the laughing third party who collects the dollars. It’s a business model that can’t hold up much longer. At some point the advertiser should be doing his math and discover that he is paying an awful lot of money for social experiments that aren’t very effective. The nature of the business model is what is wrong with it. It is a business model based upon lock-in, upon force instead of freedom. You get a free service so you MUST put up with advertisement. There is no end to the optimism of both web entrepreneurs and advertisers when it comes to the promises of web 2.0. Advertising, uhm I mean engaging with you customers, being able to use contextual and semantic information to serve him even better. The Über social graph is already being build by Facebook and the likes. And once the user is being tracked and traced across every destination he goes, the exploitation of that data surely will lead to the promised land. The data collection going on on the web is immense. It is nearly impossible to visualise the amounts of data being collected by Google and everyone else. I’m betting the actual web and it’s data is probably an infinite small fraction of what is being stored on data hogging servers around the world. I can understand why it is being done (given what I just said above). But I can’t help but feel that it’s a rush to fool’s gold. I haven’t seen a computer algorithm yet that has mastered free choice. I don’t know any data profiling scheme that can make people behave like their profiles suggest. Human nature isn’t that simple. That doesn’t mean no one is going to make a lot of money on this. I’m just saying that I doubt that all of this profiling will provide the advertisement world much benefits. You can’t make me like your message, just because the data says so. We see this behavior now already. Even though this data analysis is in it’s infancy and much better algorithms will be thought of. Ever clicked on a Facebook ad served to you? Well, not many have. Ever bought some product because when it got in the way of you interacting with a friend, you thought, “hey, that’s convenient, gotta get me one of those”. It just doesn’t work that way. I gotta get me some friends that aren’t Friendfeed fanatics. Almost every recommendation was a piece of content or discussion concerning this tool. Man these early adapters aren’t doing Friendfeed any favor with it. Hailing their trumpets, predicting the conquering of the entire world with a tool. Idiots in my opinion. Friendfeed is just a tool, and a nice one. But they are on to the same data collection I talked about earlier. Instead of just computer alogrithms, they try to use friends recommendations and discussions to filter out the important stuff. Too bad 90% of the discussion on Frienfeed is about Friendfeed itself. That data collection isn’t going anywhere for a while (Crossing the chasm is pretty difficult isn’t it). Or maybe it’s just me and my Friendfeed friends, I don’t know. I gotta get me some friends that aren’t discussing the “downfall” of Twitter. Yep, that is where the other pieces of content were talking about. Same early adopters. Same boring stuff. Morons of course. The early adopters might have jumped the Friendfeed wagon, Twitter is king of 140 characters. They don’t have to come up with noise filters, ranking algorithms, friends recommendations, semantic data collectors, or anything of the sort. They aren’t in the business of data collection and serving advertisement on that data. They are in the field of interaction. And interaction is the only thing that matters in web 2.0. Social Media consumption, creation, participation, it is all interaction. Sure they have stability issues and an angry early adapters mob against them. But they rule the 140 character world, and given the $ 1Bln spent in mobile SMS in 2007 I say Twitter has a better chance of becoming a successful social utility than Friendfeed. I don’t like the sitting back and let the feeds come to you mechanism anyway. RSS has brought us really great ways to distribute content. But it has also killed the adventuring sprrit of the web user. Instead of wandering around this marvelous world of content and people waiting to interact, we sit back and let the feeds bring it to us. Such a waist of creative processes, of discovery. And such an incredible noise generator. We are screaming for noise filters, ranking algorithms, trust filters (who the hell thinks up this stuff), all to get a grip on the never stopping river of information flowing to us via RSS feeds. Honestly, I don’t need filters to trust people, to know who ranks high or low, to know who is producing great content or noise. And I have serious doubts that ANY consumer outside the top web elite is dealing with that problem either. RSS is convenient but lazy. It brings you everything you always wanted, and a whole lot of noise with it. It needs noise filters, raking algorithms and all that other stuff. Computer algorithms telling me what to like or not. RSS is unintentional, it is sharing because we can. If there is no intent in sharing it pretty quickly becomes less valuable. That is why we all still love it to get an old fashioned letter or postcard in the mail. It is intentional and therefore so much more valuable. Try subscribing to less RSS feeds if you keep complaining about noise. It will solve your problem instantly. I always have felt the Internet should evolve around you. Making you and the things you want to do most important. Not the data hogging, or the social graph. But that doesn’t mean that you can sit back and enjoy the ride. It also implies that you have a responsibility in this. You have to be willing to look around, to discover, to make choices. Not just let that RSS juice flow to you. I’m convinced it will work out in the end. The way RSS is used now is a bit like us reading great books on well known museums. It’s fine. But actually discovering a new museum, going there, seeing the things that are there, engaging, talking about it, that is where the value really is. And that is more valuable than any RSS feed I could possibly imagine. Friendfeed may be the early adopter king of RSS feeds for now. They are there to collect data, to see if a new kind of “Google” can arise out of social media. And I suspect they will be digging in the same hole where all social networks are digging into. But it’s content right now is a museum we have all seen already. And the discussions of the early adopters are running around in circles right now. But Twitter is the king of 140 characters. They don’t need all that. They support a basic human need. They need more stability and a well executed business plan. But these 140 characters will be infinitely more valuable to us than any RSS feed with comments and likes will ever be. This entry was posted in advertisement trap, free business model, Friendfeed, noise, RSS, Twitter and tagged advertisement trap, data collection, filtering, free business model, Friendfeed, noise, RSS, Twitter. Bookmark the permalink. Spot on, sharing without intent is pointless and I would go further to say that sharing with no intent to discuss removes the value of the share. As I posted last night, it does indeed seem that the only people actually talking about anything on FriendFeed are the social media junkies – it is hardly surprising, therefore, that the bulk of this talk will then be about the social media tools. There is plenty more information of FriendFeed but almost all held in dead shares with no discussion. It seems that most users outside of the ‘tech elite’ crowd are not shifting the conversation and just getting on with whatever they are doing WHERE they are doing it, be that Twitter or wherever. Joe Public is just chatting in the place the conversation presents itself rather than relying on shares or bookmarks being pumped to them. We have gotten out of this habit and it is hard to go back once immersed in ‘the new world’. Great article, and you’re right in many ways. In regard to the gold rush aspect, i think you’re sport on. What amazes me is that it seems almost exactly the same as the dot-com boom for Web 1.0. All the same mistakes, all the same claims of huge $value, and no underlying plan for monetisation. We’ll have the same results, a very few sites/services that survive in any successful way. Not sure if FriendFeed is going to be one of them, because it’s just getting killed by the early adopters. Failing to balance the need for activity with the need to extend beyond the tech-elite as a user base. I’m not sure…is your “gotta get friends who don’t talk about FriendFeed” even possible on the service right now!? Colin, thanks. I saw your social experiment, I liked it. I sort of expected you to get the results you got. Robin, it’s impossible to find users on Friendfeed that don’t talk about it. And I am obviously one of then, even though I’m not such a big fan (but I am an idiot and a moron too). Twitter will become a social utility, whereas Friendfeed can’t. They aren’t providing the user the value needed to become such a utility. RS, even with comments and likes, just isn’t good enough. 140 character messages can be used anywhere, so much more powerful. Now only the execution, but that will come I’m sure of it. Nobody will know or give a whit what Twitter is 18 months from now, and 99.99% of people in the world don’t know or give a whit what it is today, so only .01% of all of us will give a whit if it disappeared today. I’m not an angry early adopter, I was a day-one skeptic. It is a fad. It is an IM tool that does nothing that any IM tool can’t do except force you to edit to 140 characters. My Verizon cell plan forces me to edit SMS to 160 characters if the recipient is on another carrier. So what. 99% of people on Twitter work in the tech-sector, software development, web development or advertising/marketing. Much like FriendFeed, it is an extremely incestuous naval-gazing community of early adopting, trend-setters, tech-geeks and marketers. The overwhelming majority of people, even in the industrialized world, that don’t work in the field don’t even know what YouTube is yet (yes, YouTube). I read a blog post by another marketer, I forget who. She was stunned that her hairdresser had not heard of YouTube, so she took some unscientific surveys among relatives, and friends that didn’t work in any of the above mentioned fields and revealed her eye opening experience when she found much the same. I went to a family reunion last October. About 60 relatives. Lots of 30 something professionals. College degrees. Several doctors and lawyers in the family, everyone an emailing, blackberry or trio carrying, white collar professional. Number of relatives over 30 that knew about any of this stuff, not just Twitter or FriendFeed but even MySpace, Facebook or YouTube? Zero. If I try to bring up any of this stuff, their eyes glaze over, and they look at me like I just beamed in from another planet. No surprise, if they started talking about something industry specific to their trade, or local politics from their town, I would be equally clueless. And that’s fine. None of it will be relevant to them until these technologies have matured to the point that they have been swallowed up by Google or built into Yahoo! At least that TIME cover helped us all with our CVs. @Chris, I’ve gotten that “beam in from another planet” look many times, but the general public can be brought on board easily with a solid marketing campaign. I believe that both services could transcend the tech industry. The iPhone is an example of this; it is tech heavy and in the spotlight of early adopters, but with clever marketing and Apple’s powerful brand name, soccer moms will soon be on AT&T’s 3G network. Don’t forget security professionals in your breakup of the Twitter and FriendFeed user base. They also make up a small, but notable chunk. @Alexander, one issue with scalability in Twitter is the noise factor that you expanded on in earlier posts. There may be $ 1Bln SMS industry, but is Twitter the right vehicle. Its users might drown in noise generated by millions of tweets, and I don’t know if I’d want to be around for high tide. @Matt Twitter is as noisy as the people you follow. I don’t really see that as a problem. I believe the mass market won’t be following thousands or even hundreds of people, they will only follow people they know or have found to be valuable. If it begins to become mainstream, it would take like a dozen lines of code for any SMS or IM app to incorporate Twitter like functionality into AIM, Yahoo! Meesenger, or whichever. They already have the market penetration.